Body Signals (with Dr. Stephanie Pina, ND, LAc and Dr. Qinglong Zhang, DC, DOM, MSOM, LAc) - Dr. Tom Roselle Live! Learn how your body sends signs and subtle clues that can reveal certain instabilities in your health or even indications of disorders and diseases at their earliest warning signs of illness. The information provided on Dr. Tom Roselle Live! by Dr. Tom Roselle, DC, PAK, PAc, DCCN, DCBCN, interview guests, show co-hosts, or substitute hosts is not intended or implied to be a substitute for professional medical advice, diagnosis or treatment; it is for general information purposes only. Information from this broadcast should not replace the appropriate consultation and examination process by a licensed physician. Always consult your own physician prior to changing any current medical directive or prescription. Attend a free health education class on Body Signals on Wednesday, March 20, 2019, at 7:00 PM at the Roselle Center for Healing. There will be 90 minutes of information followed by 30 minutes of Q & A for those who need additional information. This free health education lecture will be presented by Dr. Qinglong Zhang, DC, DOM, MSOM, LAc. Call to register at 703-698-7117 or register ONLINE. Dr. Tom Roselle, D.C., PAK, PAc, DCCN, DCBCN is an integrative health and wellness expert, author, talk show host, practicing health care professional, facility director, educator and philanthropist. He is presently the Chairman of the International College of Applied Kinesiology USA and he is well known for his worldwide health and wellness radio talk show, "Dr. Tom Roselle Live!," his acclaimed self-health book, "Ageless Health: Health Is A Do-It-To-Yourself Program" and his twice Emmy® award nominated television broadcast, "Ageless Health - The Special." Dr. Tom Roselle, D.C., PAK, PAc, DCCN, DCBCN is an integrative health & wellness expert, author, talk show host, practicing health care professional, facility director, philanthropist and Chairman of the International College of Applied Kinesiology. 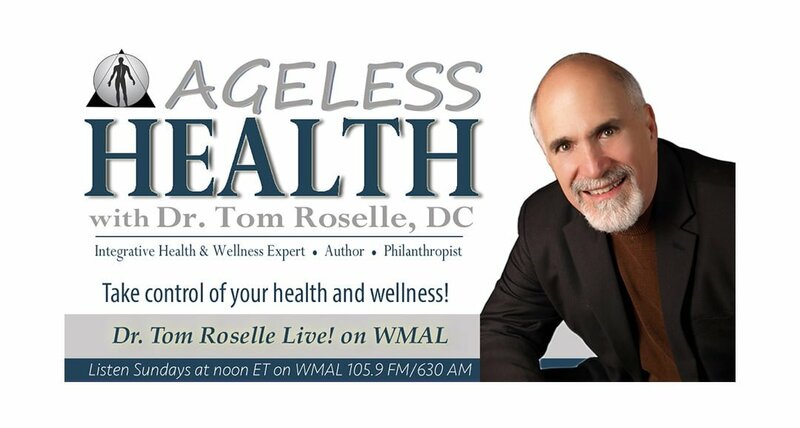 He is well known for his mid-Atlantic health radio talk show, "Dr. Tom Roselle Live!," his acclaimed self-health book, "Ageless Health: Health Is A Do-It-To-Yourself Program" and his twice Emmy® award nominated television broadcast, "Ageless Health - The Special." ©2017 Dr. Tom Roselle Live!